Operate allows you to create different templates for all of the types of licences/contracts you might be using within your organization. To get started, go to Settings > General > Templates > Licence Templates. To create a new template, click New. Select the template you want to use - You can start creating your template from scratch, using the blank; or you can use a pre-existing layout which can help customize your template a lot faster. We will work with such a layout in our examples below. Click the Template Settings button to expand its options. 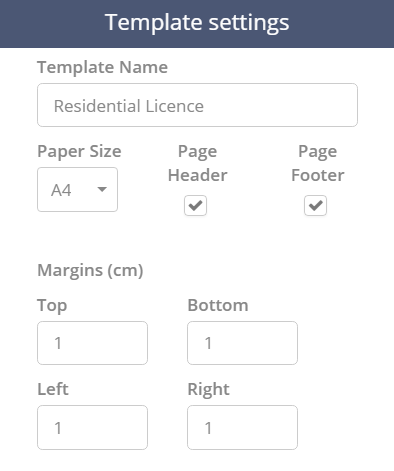 Here is where you can name your template, set the paper size, choose if you want to add a header and footer and determine the size of your margins. Click Add Merge Fields to expand the options. Here is where you can add fields to your licence. First, select a field category, then select a merge field. In our example, we are looking into the Locationscategory and we are adding a Site Name field. Now that the field is selected, all you need to do is click and drag it onto the licence layout, wherever you want to place it. Please see the demonstration below. Repeat this process for as many fields as you need to add. You can add a header and footer to your template as well - please read more here. Save your template when you are happy with it. If you want to make changes in the future, you can edit default or custom templates any time, using the pencil icon next to the template. You can delete a template using the “x” sign. To update multiple templates at once, use the Update button at the top of the list and choose the elements that you would like to update.